Toward a Definition of Antisemitism offers new contributions by Gavin I. Langmuir to the history of antisemitism, together with some that have been published separately. The collection makes Langmuir's innovative work on the subject available to scholars in medieval and Jewish history and religious studies. The underlying question that unites the book is: what is antisemitism, where and when did it emerge, and why? After two chapters that highlight the failure of historians until recently to depict Jews and attitudes toward them fairly, the majority of the chapters are historical studies of crucial developments in the legal status of Jews and in beliefs about them during the Middle Ages. Two concluding chapters provide an overview. In the first, the author summarizes the historical developments, indicating concretely when and where antisemitism as he defines it emerged. 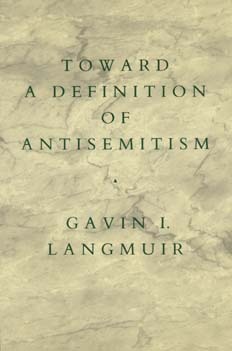 In the second, Langmuir criticizes recent theories about prejudice and racism and develops his own general theory about the nature and dynamics of antisemitism. Gavin I. Langmuir, a distinguished medievalist, is Professor of History at Stanford University. He has in preparation a third book on the formation of antisemitism, aimed at a more general audience.